Welcome to Katfrog's Corner: A Bit of Philosophy: What is the Truth? A Bit of Philosophy: What is the Truth? I heard a story once about a man in a psychiatric ward who thought he was Napoleon. One day, the man told the doctors that he was cured. So the doctors hooked him up to a polygraph and asked him if he was Napoleon. The man answered no, but the machine said he was lying. If someone wants to believe something enough, he can convince himself it's the truth regardless of reality. Think about it a minute. There is a group of people who believe the earth is flat, contrary to an overabundance of scientific evidence to the contrary. You can visit the Flat Earth Society and visit the International Flat Earth Society's forums (website still coming). Despite evidence to the contrary, people also believe that the Earth is only a few thousand years old, going so far as to present what is supposed to be a logical "proof" to back up their belief. A recent poll showed that about 20% of Americans still believe in witches, as in Samantha and Sabrina. People also believe that the rotational patterns of giant balls of gas millions and billions of miles away from Earth effect their own, individual personal lives (astrology), that the sun rotates around the Earth, that people rode dinosaur (Creation Museum), that people leave ghosts when they die, and that the Loch Ness Monster will someday be found. If you put aside your desire for these things to be true, your desire for those giant balls of gas to excuse your behavior and bad luck, your desire for magic and magical answers, and look at what's around you, really look, you will see how silly these beliefs are. 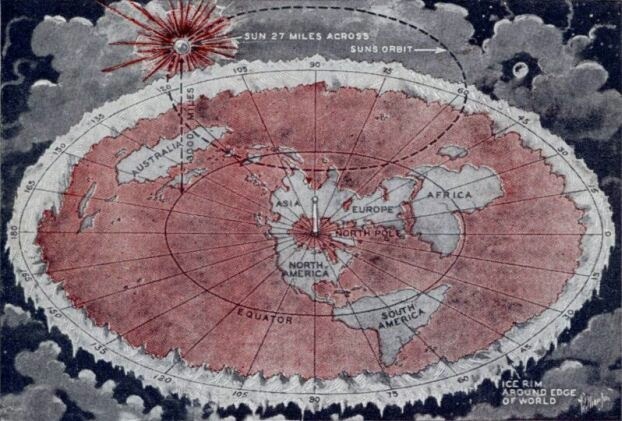 Voliva's flat earth map. Modern Mechanics and Invention, October, 1931. But most people never look. They never realize that Santa Claus is a great game of make-believe between parents and their kids. They spend so much time trying to justify and artificially quantify the insanity that they don't have the time or energy to focus on their own lives. Because with a little bit of effort and a lot of belief, you can make astrology real to yourself. Then BAM! Instant excuse for the crap in your life and eternal promises of "It will be better tomorrow". It all depends on what you want the truth to be.